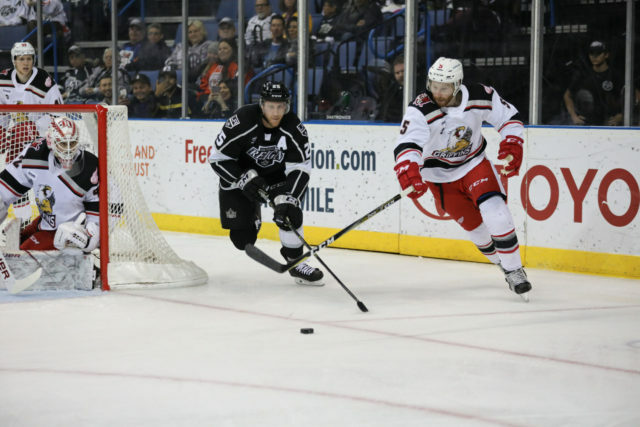 The Ontario Reign completed the season sweep over the Grand Rapids Griffins with a 3-1 victory on Wednesday evening in Ontario. 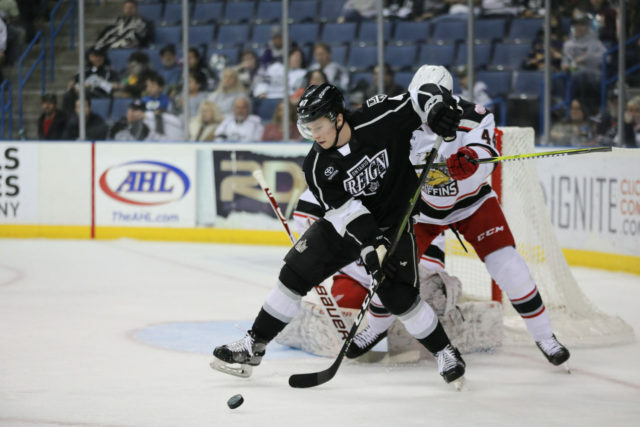 The Reign got a pair of goals from forward Zack Mitchell and 38 saves from goaltender Cal Petersen, as they began their second-to-last week of the season on a high note with a victory. After a scoreless first period, Ontario opened the scoring 1:14 into the middle stanza. 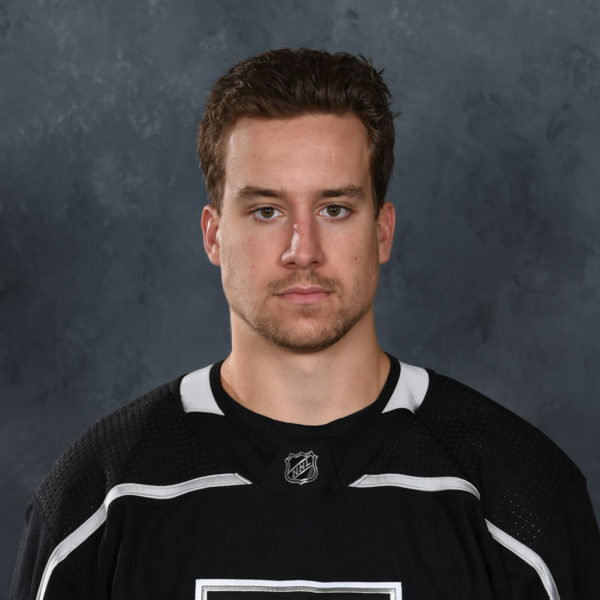 As Alex Lintuniemi sent a backhanded saucer-pass across the ice to Philippe Maillet, the Reign forward sprung forward Zack Mitchell, who made a nice move to create space before he beat Grand Rapids netminder Patrik Rybar over the glove hand to open the scoring with his 11th tally of the season. 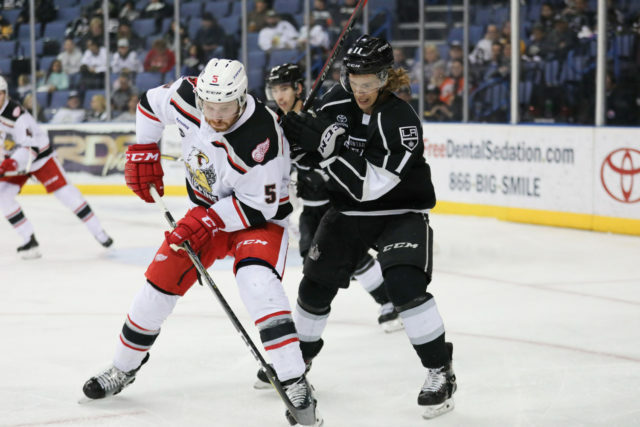 The Griffins knotted the game at one early in the third period with a power-play goal, with Wade Megan slotting home at the back post, ending Petersen’s shutout bit 43:53 into the game. Forward Carter Camper fed Megan at the back post, where the veteran tapped in for the goal. Ontario struck back with a power-play tally of its own, however, as Mitchell found the back of the net again. After Austin Strand’s shot was knocked down, Maillet directed the loose puck to Mtichell, who whacked it home at the back post for the go-ahead goal. 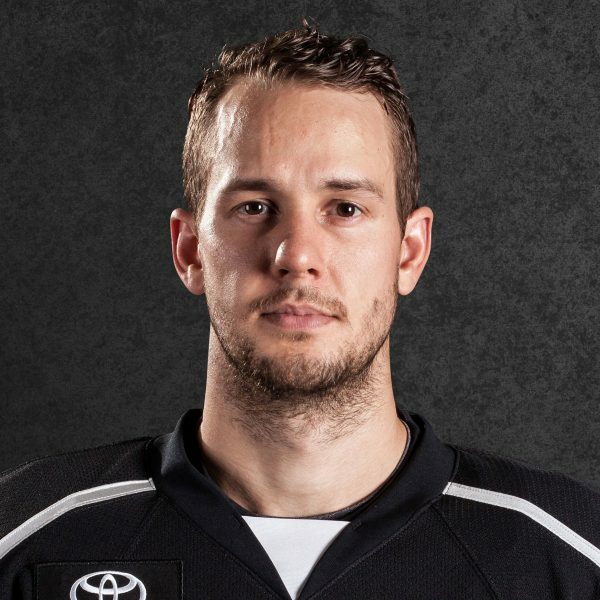 Mitchell’s tally completed his first multi-goal game of the season, the fifth of his professional career. 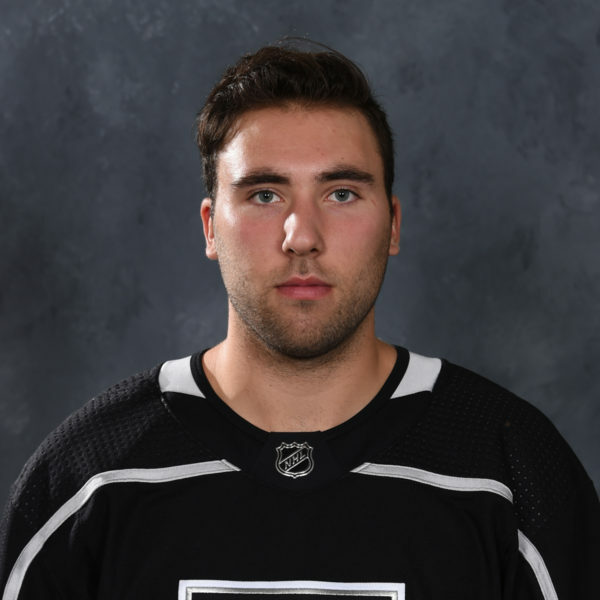 The Orangeville, ONT native Mitchell, who was buzzing all night, looked like he had a shot at the hat trick late in the third on the empty net, but opted to feed Brett Sutter instead. Forward Kyle Bauman found the empty net inside two seconds left in the game for the insurance goal, icing the game at 3-1. 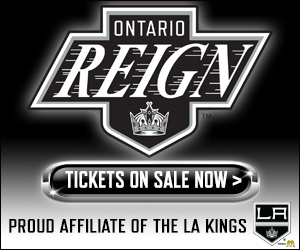 The Reign are back in action on Friday in the final meeting of the So-Cal Series, a matchup in San Diego against the Gulls, with puck drop slated for 3 PM. Well, I mean it was right on Suttsy’s tape, he just wasn’t looking at me [laughs]. I don’t know, it doesn’t really matter who gets the goal. I would’ve liked for Suttsy to grab it and put it in but that’s okay, it was a good win anyways. Our coaches do a good job of keeping us accountable, so were going to keep building and just try to finish strong and maybe play a spoiler. Yeah, that’s our first time playing together, but when you play with really good players, sometimes you just click. Those guys are both smart players and they moved well. They both see the ice, they both can score. I was lucky to get to play with them tonight and, yeah, we had some good chemistry. We’re just trying to win games. I mean, it is a business, guys are playing for contracts as well, so that’s always in the back of your mind. To be honest, if you just play well as a team, you also benefit individually so that’s all we’re trying to do. Yeah, when I got to the rink this morning, I saw my name and it was a pretty cool feeling. I texted my parents right away to let them know. It was pretty exciting. I think everyone’s just older, faster, stronger. Everybody talks about everybody being faster and stronger and it’s true. Guys are just more developed and you’ve just got to play with pace. 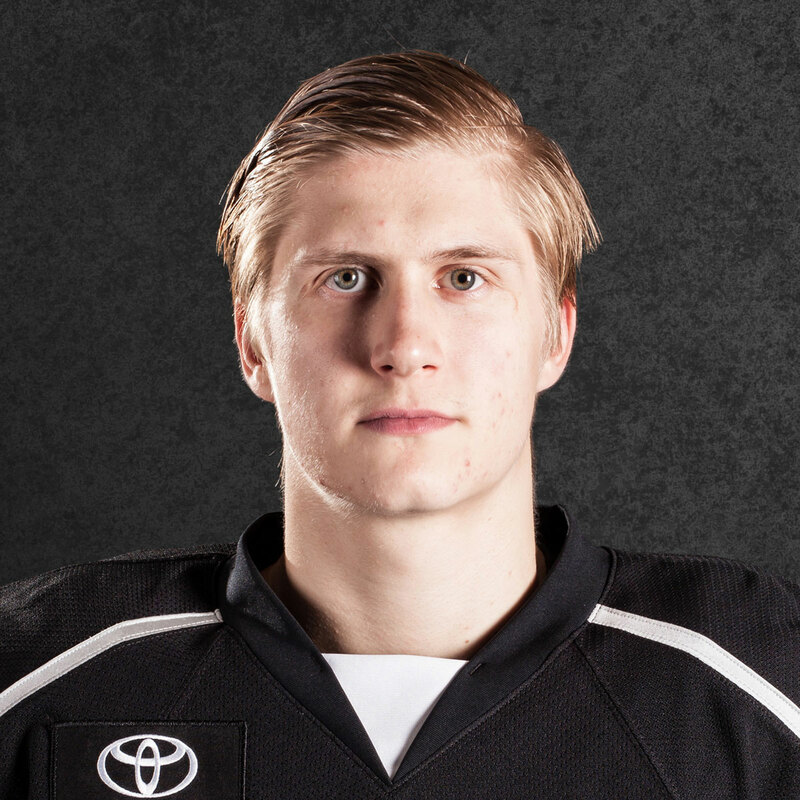 I think very competitive, smart and skilled forward that works hard every shift. Yeah, for sure, it made it a lot easier. I don’t know how you put an answer to that one. Bellsy does a great job with the power play and puts a lot of time and effort into it, both home and away. Same personnel and they’re doing the same…whatever the situation is, whatever our opponents are showing us. [Reporter: It evens out to a Top 10 unit] Well then that’s all that matters. What do we care if one’s higher and one’s lower, it’s the bottom line. Peculiar stat, but bottom line is it’s pretty damn good. The benefit is, these guys all come to training camp, whether it’s rookie camp on through to the main camp. The systems are laid out every single day, through video, through practices, so they do get an idea of it and they don’t come in blind. Whenever we bring guys in, Bellsy or Mods will show them a little refresher on our systems, video wise, sit with them and walk them through situations and we do much the same during practices. We always have a video, a pre-scout, on what to expect from our opponent, so we try to give them as much information as we can to try and make them a little bit more comfortable, but you know what, the game is hockey. You’ve got to have some hockey instincts, some hockey skill. In order to get to this level, you have to have some hockey ability. At that point, you give them the basics of the structure and then hopefully they can pick it up as they go. That’s why, you can have guys that have a complete language barrier, but they’re able to pick it up and practice and play games, because it a natural, hockey tendency and they’ve been ingrained all their life growing up playing it. It’s just more of these guys getting a chance to play and getting that excitement of getting their first pro game, or their first couple of pro games, under their belt. At some point during the season, all of our guys have played together. Sometimes, it’s like the bingo balls – whatever three come out, that’s who goes on ice. And then, we’ve had other times, where we’ve had some consistency. Mitch didn’t play last game, came back in and played real well for us. Luffer and [Maillet] looked like they had some good jump in their legs tonight, was a real effective line for us.